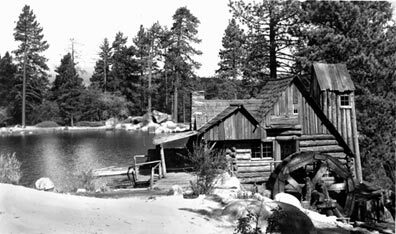 A couple miles west of the Big Bear village, up in the hills off of USFS road 2N10, nestled in the woods, is a small manmade lake, which is the home of the Cedar Lake Christian Camp. Today it provides lodging and camping accommodations to private groups, and is also a popular location for the film industry. Cedar Lake was constructed in 1928, as part of an ambitious resort and real estate development that never materialized . Since then, hundreds of movies have been filmed in this picturesque location. Click here for more photos, and the story of historic Cedar Lake.